PBS KIDS debuted a new, free app designed to help kids build math skills and empower parents to support their learning. Designed for 3- to 5-year-olds, PBS KIDS Measure Up! focuses on building kids’ measurement skills through a combination of games, videos and activities from popular PBS KIDS’ series. The app also connects to a companion app with tools for parents and caregivers to track progress and find ideas for activities away from the screen. In PBS KIDSMeasure Up!, children can visit a world with characters from PBS KIDS’ series DINOSAUR TRAIN, PEG + CAT and SID THE SCIENCE KID. There, they explore concepts of length, width, capacity and weight while collecting rewards through a combination of games, videos and activities. Grounded in research that demonstrates that engaging with a variety of types of PBS KIDS content accelerates learning, PBS KIDS Measure Up! thoughtfully sequences different types of media to build key math skills. The games and video content within the app experience have been rigorously tested, ensuring that they offer a positive learning experience for kids. PBS KIDS Measure Up! was developed as part of the Corporation for Public Broadcasting (CPB) and PBS Ready To Learn Initiative with funding from the U.S. Department of Education. Ready To Learn is a federal program that supports the development of innovative educational television and digital media targeted at preschool and early elementary school children and their families. “This innovative new app demonstrates public media’s ability to engage children through free, high-quality educational programming across all platforms,” said Debra Sanchez, CPB’s senior vice president for education and children’s content. Bringing parents into the learning adventure, PBS KIDS Measure Up! connects with a free companion app for adults: the PBS KIDS Super Vision App for parents. 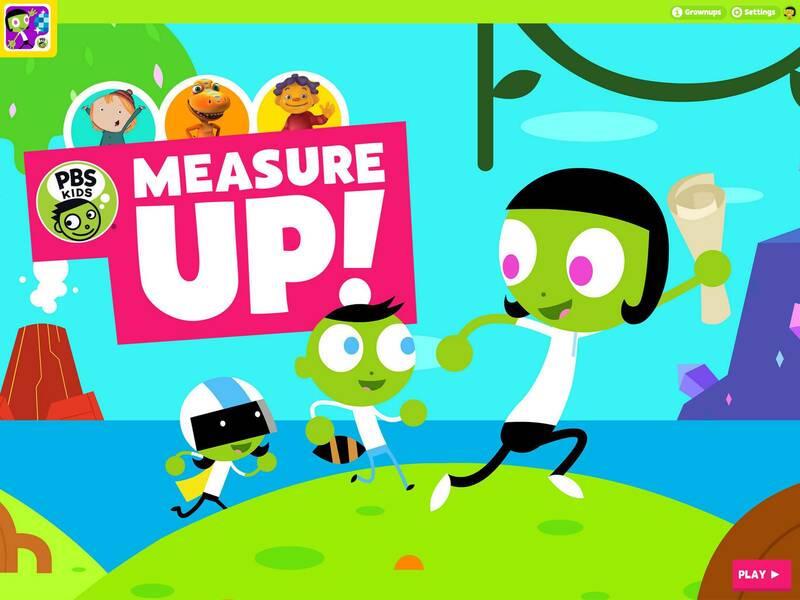 PBS KIDS Super Vision provides parents and caregivers with updates on their kids’ progress throughout the Measure Up! app and shares information and recommendations, suggesting related activities that they can do with their children to build on the skills they are developing. Through these features, parents and caregivers can engage in, better understand and guide their children’s learning. Tools for educators are available as well. As a companion to the Measure Up! and PBS KIDS Super Vision apps, PBS LearningMedia has developed a free measurement-themed iBook for teachers, which will be available next month. More information will be available at pbslearningmedia.org. PBS KIDS Measure Up! is now available for free on iPad, as well as Android tablets in the Amazon Appstore, and is coming soon to Google Play. PBS KIDS Super Vision is now available for free on iPhone and iPod touch, and Android mobile devices on Google Play.